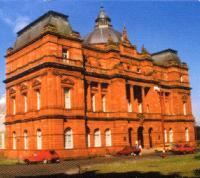 The People's Palace is Glasgow's social history museum, set in historic Glasgow Green. It tells the story of the people and city of Glasgow from 1750 to the end of the 20th century. Explore the city's social history through paintings, prints and photographs and a wealth of historic artefacts, film and computer interactives. Discover how Glaswegians lived, worked and played in years gone by. In the adjacent Winter Gardens you can wander among the exotic palms and plants or enjoy a coffee or lunch at the café. Outside, you can admire the restored Doulton Fountain and relax in the attractive surroundings of Glasgow Green, one of the oldest public spaces in Glasgow. Parking on Glasgow Green east and west carriageways. Free parking on Glasgow Green east and west carriageways.